That's my bday, so hopefully I can make it! Ooo, maybe I can make it this time! Humbug. I'll be in Jersey that day and probably seeing Mad Max with my siblings around that time. Alas, I'll have to wait for final release. What would you like to see? Let me know, and I'll try to fit it in if possible and if I'm allowed to show that portion of the game. Holy clever boss fight, Batman! That is clever. It looks like something the Galaxy team would have thought up if they had those mechanics to work with. I wonder how much single player stuff like that will be present in the full product. There are 5 (maybe 6) Worlds, and 27 plus 'levels' consisting of 5 or 6 levels for each world, and then a boss at the end of each world. I'm assuming there's a boss at the end of the whole thing as well (haven't quite got there yet). Cool, that's more than I was expecting. If that level of creativity keeps up, I might nab it for the single player alone and mess around with multi as a bonus. The mechanics look really crisp, and most of the impressions I have read have backed that up. I'm a sucker for super polished gameplay, so that's quite appealing to me. Edit: Heh, reading that back, I feel kind of weird for pointing out that I am drawn to polished gameplay, but I feel like I'm in some weird minority in that regard while browsing these forums a lot of the time. It seems like all the kids nowadays are playin games for the story I simply cannot relate. Says the guy with a Dark Souls avatar in a Nintendo game thread. You don't say? I honestly play a game for a variety of reasons, and sometimes story will help me get through unpolished gameplay, while good gameplay is sometimes all I need. In almost all cases, if the gameplay is terrible, I will not even touch a game. Heh, reading that back, I feel kind of weird for pointing out that I am drawn to polished gameplay, but I feel like I'm in some weird minority in that regard while browsing these forums a lot of the time. It seems like all the kids nowadays are playin games for the story I simply cannot relate. Heh. I'd been under the impression that the kids weren't in it for the story these days, necessarily, but that they're much more willing to tolerate gameplay jank than I am. All those half-finished Early Access games and semi-baked indie titles with pretty art? Nopetopus. 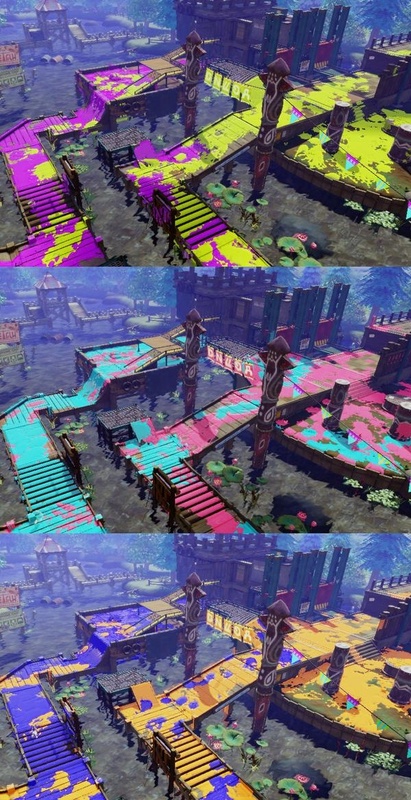 Just wanted to let everyone know that I'll be doing a live stream of Splatoon tonight at 9:30 Eastern on my twitch channel at twitch.tv/gamerparent. Nintendo Canada were nice enough to let me have a review copy so I'm happy to be able to show you some of the game before release. I'll be mostly showing the Single Player campaign, the first level up to the first boss, and then some of how the gear and weapon shops work. If there's something that you'd like to see, let me know and I'll try to show it to you. It looks like you were playing with the gyro controls off, is that right? Did you try out the gyro controls and just didn't like them? For the purpose of the Battle Dojo, one person has the gamepad, and plays on that screen, while the other plays with a controller, and can only use the Right Stick for camera. What you saw there was analog stick camera. I personally prefer the motion control, and that's what I used for the rest of the stream. We actually argue over who will get the Gamepad for Battle Dojo because none of us like using the analog stick, we all prefer the Motion Control. I meant in the first level and boss fight. It looked like you were aiming with the sticks. Nope, I was using the motion control. I'm not sure if that's a compliment or not? Can 2 people go online from the same console? I could see my wife and me having a lot of fun with this. I'm digging the stream replays. Thanks for sharing! Are you aware your commentary is only coming out of the left audio channel? It's not a big deal when there's game audio, but at the very beginning where it was just you I thought something was wrong with my headphones. Thanks for watching. Yeah, there isn't a way for two people to go online at the same time, unfortunately. I was made aware of the mic issue, and I know what to do to fix it for next time, but thanks for letting me know. Apologies for some of the technical issues, it won't happen again. I don't know about the rest of you, but I feel like I'm seeing ads for this game everywhere I look. Target has a looping ad on all its display TVs, I've seen ads before videos on YouTube and Hulu, there was a lengthy segment in the pre-trailer loop in front of Tomorrowland, plus banner ads and ads in print and... Nintendo is pushing this as hard as (maybe even harder than) Mario Kart 8. What's interesting, though, is just how they're advertising it and what they're focusing on. Since this was announced, the press and gaming communities have mostly been referring to it as Nintendo's take on the arena shooter, but Nintendo itself doesn't seem to be making that comparison. And where shooter ads are usually about beating your opponents, most of the ads I've seen for this have emphasized that you the player will get "splatted" and that that's not only inevitable but part of the fun. The emphasis is just on fun and excitement, not victory. Kind of a nice way to reassure people that it's "for" them even if they can't hold down a good K:D ratio. Also, their "hero" inkling at the front of most ads is a girl. I still think that's freaking cool and outside the norm for shooters. Kind of a nice way to reassure people that it's "for" them even if they can't hold down a good K:D ratio. 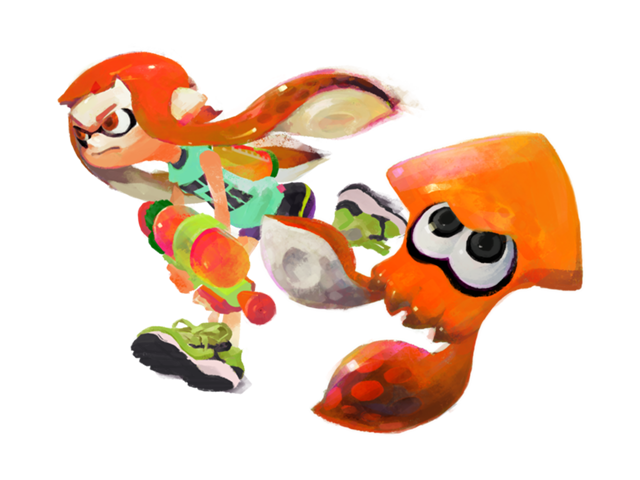 I think for a while most of the press I pay attention to thought there weren't male inklings. That's really cool, and goes hand-in-hand with Nintendo's recent announcement that they want to work on attracting more female gamers to their platform again. There's a Iwata Asks with the Splatoon team. Having two proto-gamers in the house, who just happen to both be girls, they refer to Splatoon as 'the game, with the cool music, and the girl who likes to get all messy'. I'm so getting up at 6am tomorrow to try out the last test fire, Sunday morning or not (I have kids, like it being the weekend EVER changes my wake up time). Any idea if the friends pairing will be up and running for tomorrow, being as its so close to launch, or is that a 'much later' feature? I doubt it will be any different from the first demo. Unless they change something in the code, it will probably be the same as last time. It doesn't really impact it too much, the experience is still fun at the core. And yeah, my two girls are super keen on the game as well! It's smart, too, since how many shooters are marketed to girls? Untapped market and all. I see bundles with a Squid Girl, a Squid, and a Squid Boy. What exactly do these amiibo add to the game? Forgive my ignorance! I've been slow with gaming news as of late. It's out so soon! I've been way behind with Splatoon coverage, so it had quite snuck up on me. Excellent! They add some challenge modes for single player and a few costumes. Hmm. More single player content is cool. Now I need to decide which one to pick up! I think I saw an offer for the Squid as oppose to the boy or girl. In game, but not connecting here. Just got a failed to connect after about 5-8 mins. I just got on, and I'm not able to get in. We just got bumped as well. Trying again but no luck. Servers must be catching fire.